Tamil Nadu and Kerala, being neighbours, share quite a few recipes. Avial being one of them. 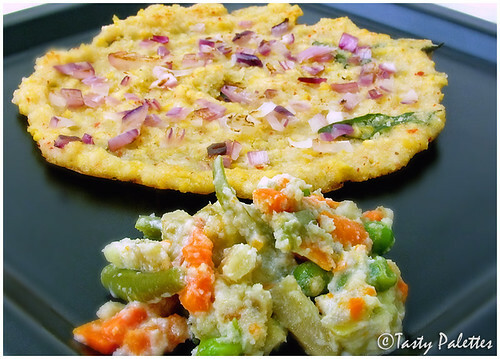 Though it tastes excellent with rice, I find Adai-Avial combination, quite enticing. Avial essentially means ‘to be cooked’. Colloquially, it also refers to a mixture of anything and everything. And that is the idea. Any seasonal vegetable other than okra, bitter gourd and colocasia (arbi) can be used. Drumsticks are a favourite candidate due to their aroma. This can be had with rice/sambar/thogayal or adai. Though avial tastes better when fresh, it keeps well for 2 days in the refrigerator, without yogurt. Add yogurt only to the portion that is to be served. This celebration of vegetables is my entry to Vegetarian Awareness Month, hosted by Margot of Coffee and Vanilla. Cook all vegetables until done. This can be done using microwave oven or over stove top. They should not be mushy, but slightly crisp on the inside. Grind coconut and green chillies to a fine paste and add to the cooked vegetables along with salt and curry leaves. 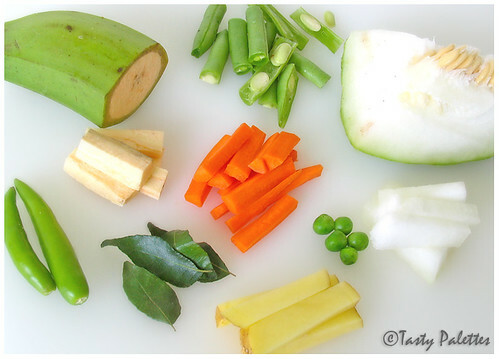 Gently heat vegetables along with the ground paste until green chillies do not smell raw, about 3 minutes. Take care not to mush the vegetables while mixing. Just before serving, combine yogurt and a tbsp of warm coconut oil to avial and serve. Avial goes very well with paruppu usili. But the eternal combination is Adai-Avial, which can be seen served even today in many of the South-Indian restaurants. Hearty lentils combined with sweet vegetables and cool yogurt compliment each other. Soak rice and dal mixture separately for at least 2 hours. Grind rice along with red chillies, salt and asafoetida to a coarse meal. Then pulse the dal mixture, barely grinding them. Mix them both along with curry leaves. The batter will be quite thick. Heat a tawa or griddle. 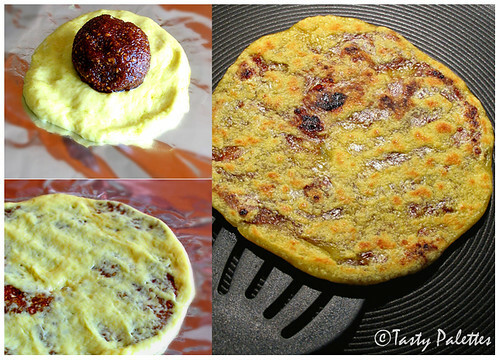 Place some batter in the tawa and spread them to form a circle. Make a dent in the center. Top the batter with chopped onions. Drizzle oil around the adai and in the center. Cook this over medium heat. Flip to cook the other side. Serve with avial, idli podi, butter and jaggery. 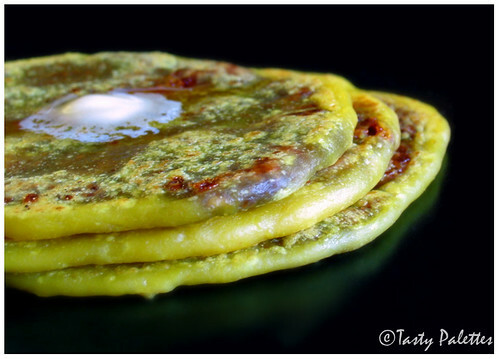 For a crisper adai, do not grind dal to a fine paste. The bigger the better. You can even add a handful of soaked chana dal to the final batter for extra crispiness. Onions can be topped or mixed into the batter. Cabbage, drumstick leaves are the other usual toppings. As another variation, omit onion/cabbage and mix a handful of grated coconut to the batter. The adai will be softer. I love pancakes! Who doesn’t? They are easy and versatile. Served with a seasonal fruit, they are one of my favourite brunch ideas. I make ‘em in bulk and freeze ahead, to devour on those mornings when I crave for a warm breakfast. The Amish starter was a perfect base to fluffy and tasty pancakes. The holes in the pancake speak for itself. I enjoyed every bite of it that I am happy to share this as the final installment of 1-in-3 Amish Friendship Starter. I developed this recipe according my preference. Feel free to alter to suit your taste. 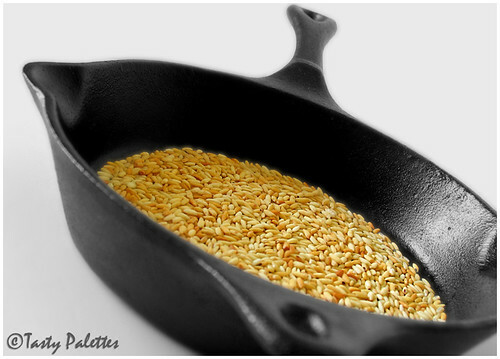 A handful of flax seeds or chopped walnuts will be a nice addition. Mix all of the above just until combined, without over mixing. Heat a pan or griddle and pour ¼ cup at a time. Brown both sides and serve with your favourite condiments. 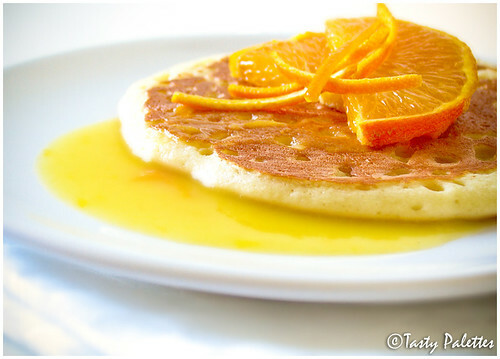 Amish pancakes served with orange sauce. Almost all the bread recipes with Amish friendship starter I have looked up, calls for instant pudding mix in addition to other flavouring agents. Since making naan, I knew the starter tastes good when cooked as such. So why not make an ordinary loaf of bread? Hence born the second idea for 1-in-3 Amish Friendship Starter. The measurements given below yield one small loaf that got over between the two of us, when I served with afternoon coffee. Thanks to Cynthia for your handy dandy tips on baking this bread. Mix the first four ingredients to form a tight dough. Place this in an oiled bowl and cover with a damp cloth. Keep this in a dark warm place for 20 hours. Punch down and knead the dough well. Shape into a loaf, cover with a damp cloth and let it rise again, for 2 hours. When ready, preheat the oven to 450F and put a cast iron pan/pot in the oven as it preheats. After 20 minutes, carefully remove the pan/pot. Line the inside with a parchment paper, sprinkle cornmeal and place the shaped dough on the parchment paper. This will ensure that the bread doesn’t get burnt. Cover the whole pan with foil and bake for 25-30 minutes. The bread is done when it sounds hollow when tapped. Cool, slice and serve with coffee. 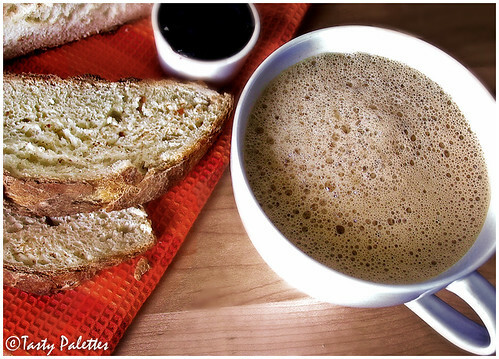 Friendship loaf served with Indian style filter coffee and blueberry preserve. As you may all know by now, my entry “Eggs…Through My Lenses” has been awarded the Click’s Reader’s Choice Award, hosted by Jai & Bee of Jugalbandi. The reason I got this award is you, my dear readers. I am grateful for your support and a bunch of Thanks for those who voted for me (and those who didn’t too ;) ). My hearty congratulations to other winners Sunita, Manisha and Andrew. Hosting and judging the entries should have been a monstrous job, but it’s a job well done Jai, Bee, Meeta and Jaden. Kudos! When Nupur sent me that sour-sweet smelling package, I meticulously followed the tradition and baked Pineapple-Cherry Bread. But after working with the starter and understanding how to use it, rather manipulate it, opened a door of opportunities, or recipes, I should say. This 1-in-3 series is about my experiments with the starter. I am not going to give instructions on how to feed the starter. 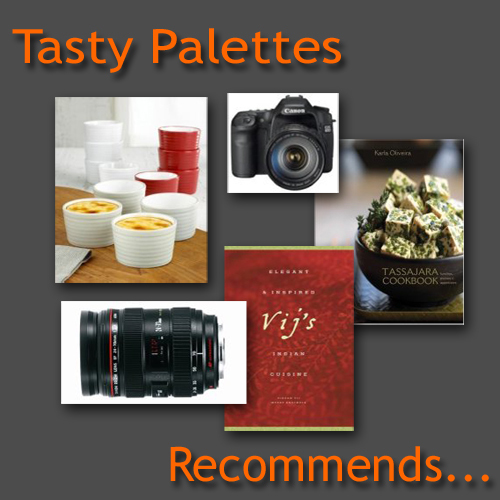 You can find it here, along with other recipe ideas. If you are looking to make the starter on your own, this recipe may be of help. But I cannot vouch for the recipe as I haven’t tried it. With many thanks to Nupur for sending me the starter, here is 1-in-3 Amish Friendship Starter. Most of the recipes I develop are by intuition. Things I strongly believe will work, even though I am trying it for the first time. After observing the active starter, one thought that screamed inside my head was flat bread. Unsure, I set out to make Naan, the Indian flat bread, to be on the safer side. I had no reason to be unsure. The naans were A-Class. Combine starter, salt and flour to form a stiff dough. Add more flour depending on the moisture in the dough. Cover and rest the dough for 6-8 hours. When the dough has risen, punch down, knead well, cover and rest for another 2 hours. When ready, preheat the broiler. In a small bowl, combine garlic, herb and oil and keep ready. 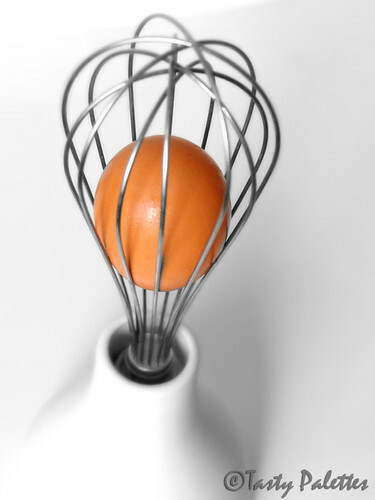 Pinch an orange sized dough, and roll into a tear shape. Place on a hot pan, and cook until both the sides develop light brown spots. Transfer the naans on to a cookie sheet and broil until dark brown spots develop, about 30 – 45 seconds. 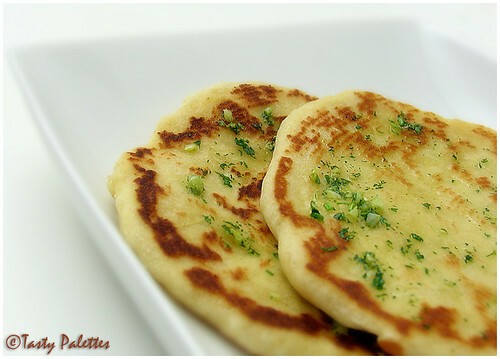 Brush naans with garlic oil when they are hot out of the oven. Serve with your favourite masala. This recipe yields 7 medium sized naans. 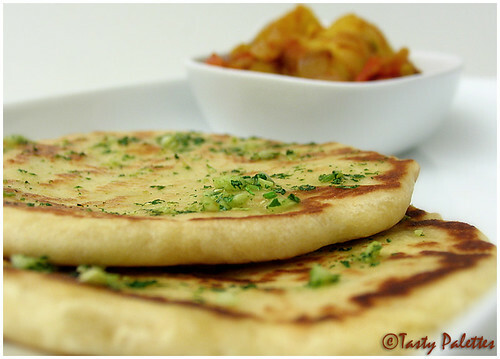 Naans serve with Indira’s Aloo Masala. If you are not able to read what the title says, don’t bother. 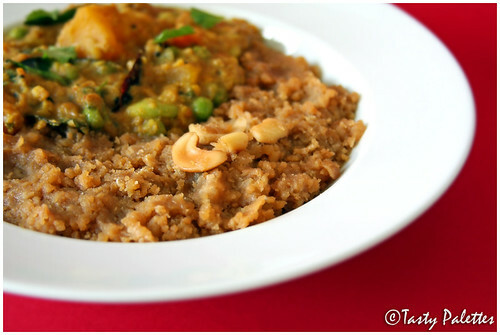 Kali is rice cooked with jaggery and Ezhukari kozhambu, which is sambar with 7 vegetables. This is a classic combination made for the festival of Thiruvadhirai. Thiru + Adhirai is Thiruvadhirai, which is the birthday of Lord Shiva. Adhirai is, obviously his birth star, and hence the day is called Arudhra Dharisanam. I remember my Grandma pointing this star in the Northwest skies. It sparkles like a ruby, in bright red. Facts apart, I love this festival, food being the primary reason. I am not a big fan of sweets, but ok with anything mildly sweet. Kali being rice cooked with jaggery is served with a savoury sambar. The sweet and spicy combination is like yin-yang for the taste buds, and I absolutely love it. 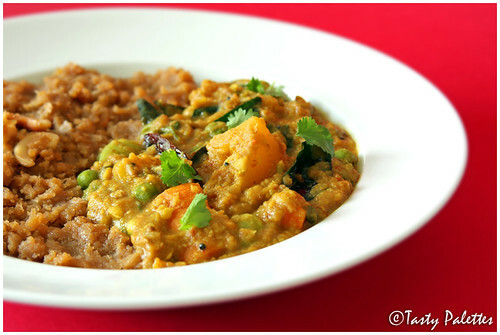 This kali is also made with a mixture of rice and dal. Since the kozhambu has dal in it, I don’t find it necessary. The measurements given below serves two people. Roast rice until red. Wash rice and grind into a coarse meal, like rava. Roast cashews in a tsp of ghee until golden brown. Set aside. In a pan, heat water and dissolve jaggery. Once dissolved, add coconut, ground rice and a tsp of ghee. Mix well and transfer to another vessel. Pressure cook this for 2 whistles. When done, cool and fluff. Mix roasted cashew nuts and ground elaichi. Serve with kozhambu. 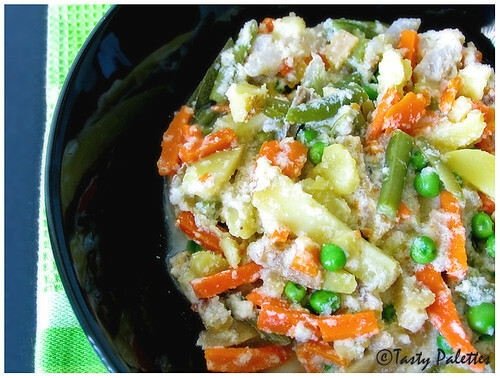 Ezhukari kozhambu is supposed to be made with 7 vegetables, but you can add as many or as less as you want. This is more like sambar, but with lots of vegetables. In olden days, after the festivities are over, the ladies would mix left-over vegetables and sambar that was made earlier in the day. The resultant gravy is a delicious mixture of sweet root vegetables(plenty during the season) and spicy sambar. My family calls this “Ericha Kuzhambu’, which loosely translates to sambar that is heated over and over again. This kuzhambu tastes better as it grows older, like wine. Well not that old, but 2 or 3 days. When this gravy is heated again and again, the vegetables almost melt mixing with spices. What is left is a divine concoction that goes well with almost everything, dosa and curd rice, in particular. If you are worried about nutrition depletion due to over heating, please look away. This is beyond all of that. Roast all of the above in a tsp of oil and grind to a fine paste. Vegetables that can be used are Red pumpkin, White pumpkin, eggplant, sweet potato, potato, lima beans, peas, plantain, yam, elephant yam, colocasia, green beans, runner beans, cluster beans, chayote squash(chow chow), green chillies, snake gourd. Pressure cook dal with a pinch of turmeric powder. In a big pot, mix vegetables, tamarind paste, turmeric powder, salt with enough water and boil until the vegetables have cooked and tamarind doesn’t smell raw. Combine the ground paste and cooked dal and bring it to a boil. Allow this to boil on a low flame for 5 minutes. Adjust seasoning as required. In a small pan, heat oil, splutter mustard seeds and throw some curry leaves. Add this to sambar, along with cilantro and asafoetida. Serve with kali. This is my second entry for RCI – Tamil Festivals, hosted by Viji. 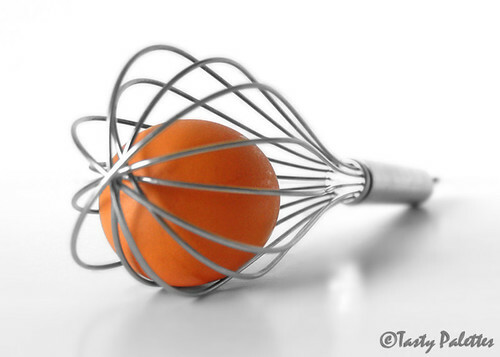 Have you ever created a recipe in a whim? Even if a variation of the recipe already exists (as I found out later), it still gives pride to have achieved something this pleasant. When we craved for a warm dessert one evening, I put together this recipe with what I had on hand. Apple pie was the basic idea, but without the crust and hence the calories. Needless to say, it was an instant success. Since then, I have made this recipe several times now and it has been perfected every time, to suit our palette. When Joanna announced Heart of The Matter – Baking, I knew this is the recipe I am going to submit. So far, I have used a tbsp of cold butter for the crust/crisp. To make it even healthier, I did what I always do to make anything fat free – Apple sauce. I had to increase the cooking time by 5 minutes, due to increased moisture. Replacing butter with apple sauce made the crust slightly chewy than crispy. But, hey, with a guilt-free dessert like this, I have no complaints. This is great for entertaining your guests too. You can make this ahead and keep it in a 200F oven, until served. Apples cook down considerably, hence, try packing as much apples possible into the ramekins. If you don’t have pumpkin pie spice, use a mixture of ground cloves, allspice or cinnamon, ginger and nutmeg. 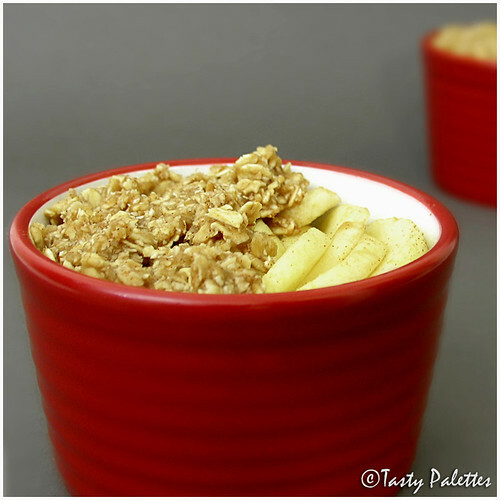 Oat bran is added for a bite which is a nice contrast to the soft apples. You can omit that or substitute with all-purpose flour. Preheat the oven to 375F. Peel, core and thinly slice the apples. Toss the apple slices with lemon juice, cinnamon and 2 tbsps of brown sugar. Set aside. In another bowl, mix rolled oats, oat bran, apple sauce, ¼ cup of brown sugar, pumpkin pie spice and salt, until well combined. Take 2 ramekins and divide the apple slices equally between the two. Tightly pack the slices as much you can. 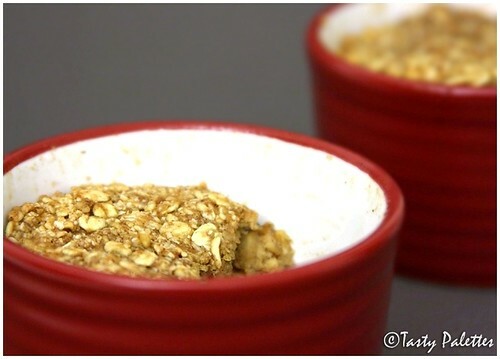 Top with the oats mixture prepared above. 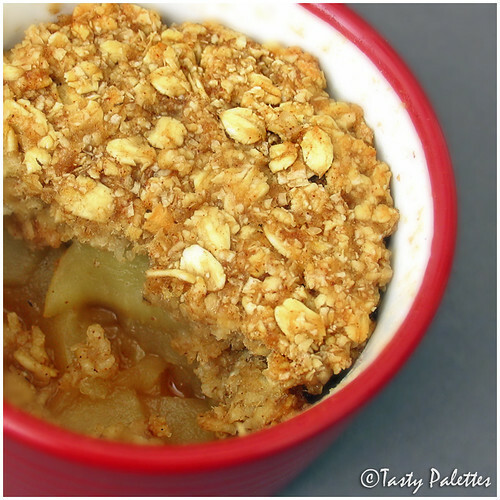 Pop in the oven and bake for 25 minutes, until apples are soft and the oats flakes are toasty. Let stand for 5 minutes and serve warm. You can also serve this with ice cream or freshly whipped cream. I didn't bother for ice cream; it was devoured within minutes. 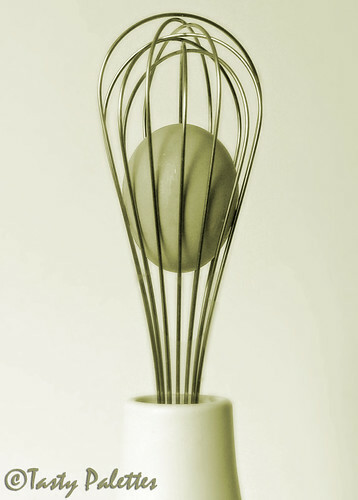 Eggs are a staple in my kitchen. When I am not in the mood for an elaborate meal, but want something quick, tasty and nutritious, I turn to eggs. Be it breakfast, lunch or dinner there are a hundred ways to prepare them. For the carbohydrate part of meal, I usually make potatoes or bread. But today, I made a sandwich along with some vegetables making it a wholesome meal. Bread + spread + filling = A wholesome sandwich. For this sandwich, use a crusty bread or focaccia for added flavour. Mayonnaise is jazzed up with fresh herbs for a spread. You can use goat cheese with herbs or cream cheese with sun-dried tomato pesto. Similarly, flavour the filling, i.e., eggs, with your choice of fresh/dried herbs. Add grated cheese like Parmesan or Romano for another layer of flavour. In short, this is more than a method than a recipe. Play with it until you find the combination that fits you. Preheat oven to 300F. Cut bread horizontally. Mix mayonnaise and fresh herbs and apply to both halves of the bread. Heat 1 tbsp of oil in a skillet. Sauté onion and garlic until they become soft, about 5 minutes. Set aside. Heat the rest of the oil in the same skillet and prepare omelet by whisking eggs, milk, Herbes de Provence, salt and red pepper flakes. Remove and slide the omelet over the bottom half of the bread. Layer sautéed onion, spinach, bell pepper, in that order. Season the vegetables with salt and pepper. Top with the upper bread half. 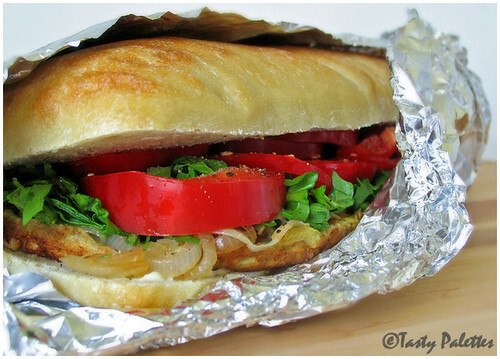 Wrap the whole sandwich in aluminum foil, place it in a baking sheet and bake for 15 minutes, until the bread has heated through. Slice and serve hot. This is my entry for Weekend Breakfast Blogging – Omelet, hosted by Kanchana. Nandita is the brain behind this event. Whenever I make a rich curry or masala, I prefer to serve it with a milder tasting rice. But making peas or jeera pulao over and over pushed me to look for other options. I landed making saffron rice, and needless to say, instantly took a liking toward it. 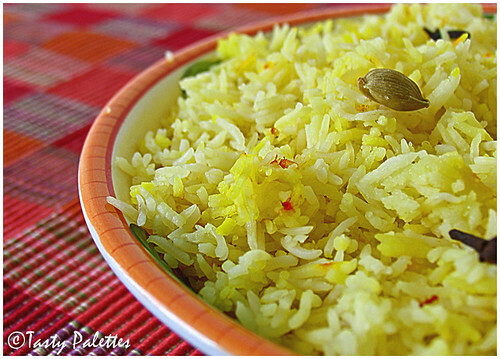 After all, what is there not to like about saffron and the aromatic basmati rice? Sunita, this is my humble entry for Think Spice – Saffron. Mix all of the above and pressure cook until 2 whistles. Fluff and serve. 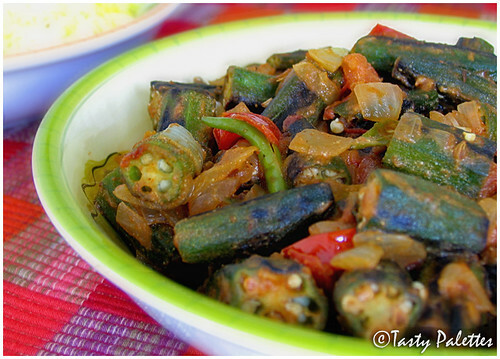 When I see okra, I can only think of it in sambar, pan fried with spices or stuffed. But when they are abundant, I venture into untrodden paths. This curry may sound simple, but the tangy yogurt and sweet okra are a good duo. Heat oil, and toast cumin seeds. Add onions, green chillies and garlic and sauté until onions turn soft. Add tomatoes and sauté for another minute. Add okra, coriander powder, turmeric, red chilli powder and salt. Mix well, sprinkle water, cover and cook until okra is done. Sprinkle garam masala and add yogurt. Combine well and heat through. Yes. You guessed it right. 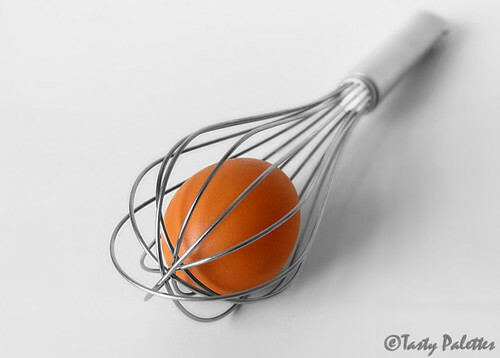 I have been doing my experiments with egg for Click, the new event on food photography based on a theme; an innovative idea by Jai and Bee of Jugalbandi. Kudos guys!